Michael 'Mike' Turner is handsome, bright, a resourceful law student and perfect gentleman. 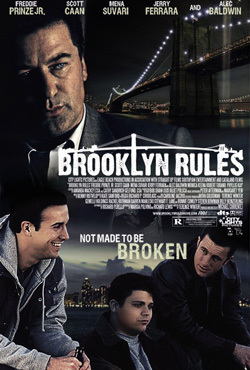 Mike were perfect hadn't he been born in late 20th century Brooklyn, a New York borough dominated by the mob, in his case Carmine Mancuso, who luckily chooses to protect bright Mike, even against mob ruffian Gino, and his two inseparable buddies. Cocky Carmine Mancuso actually chooses to join the bloody business, sparing only his youth friends. Third mate Bobby Canzoneri, whose equally dumb parents hosted the gang as kids, naively aims no higher then tenure in the US Post. Yet Bobby ends up dead when a mob war erupts.